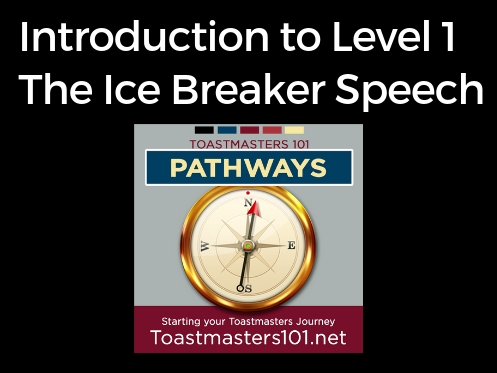 Simply put, the Ice Breaker speech project is to introduce yourself to your club. This is your story, your reasons for joining, your goals – whatever you want us to know about you. For 4 to 6 minutes, you get to talk about yourself. For a lot of people, this seems intimidating. What if I choke when I get up there? What if I don’t know how to write a speech? Or… what if I’m boring? Stage fright is a real struggle for everyone. We all get some symptoms that we have to deal with because that’s what our human bodies do when faced with stress. We sweat, we want to run away, we want to vomit, we shake – the list is extensive. Please believe me when I tell you that this is normal. Those symptoms are the signs that you’re preparing to do something new and challenging. Some people equate the fear of public speaking with stage fright symptoms. That’s a myth. While they are obviously connected, have you ever noticed that many of those exact same reactions are what we have when we are excited? Suppose you have the opportunity to meet your favorite celebrity. Would you be tongue-tied? I was! Suppose you’re about to get into the car of your dreams? Did your hands shake when you’re given the keys? Or the roller coaster you just waited 2 hours to get onto? Or your wedding? Think about your body’s reactions to those events and you may notice that your body’s reactions are exactly the same – but are you afraid? No – you’re excited! It’s your frame of mind that calls your body’s reactions either “stage fright” or “excitement.” Your attitude makes the difference. Not that that knowledge is going to be of much help at this moment, but it’s good to know. What you’re going to learn as you grow as a speaker is that those symptoms don’t have to stop you! That energy that makes your throat close up or your knees knock can be redirected into your speech. Give it time – you’ll see it happen! What if you don’t have stage fright? If you don’t have stage fright, it’s not a sign that you’re a naturally great speaker or that there’s something wrong with you. This just isn’t the thing that makes your body react. It’s like taste. Some people like Brussel’s sprouts. I happen to love them. But I know there are a lot of people who don’t. That’s ok.
What if you don’t know how to write a speech? That’s pretty much what we teach you. If you’re here to learn, we’re going to demonstrate it in our own speeches, we will evaluate speech construction, and the material in Pathways covers it. Don’t worry about speech organization yet! Everything in your Ice Breaker speech is about you. Tell your own story! I won’t think you’re boring. After all, I don’t know you yet. I’m going to be waiting to get to know you! So you can’t bore me. Don’t worry about it. You’re not a stand-up comic I’ve paid to see- you’re a fellow traveler. We’re going to help each other. Before you give your speech, you will be introduced by the Toastmaster of the Day. Most clubs want the speaker to provide a short introduction that includes the Pathway name, the level and project names, as well as your name and the title of your speech. The club may have a form that most speakers use – ask your Vice President of Education if there’s one to use. Or you can download on from here at toastmasters101.net/intro. Don’t forget to go back to the website and finish your project work by completing the post-speech quiz. It’s the same 5 questions you answered before you started. I hope you’re doing better than when you started. (Sometimes, I don’t.) Make sure you hit the submit button! Then the club officers will approve the completion of the task and you can move on! We’ll talk about the double speech project next. Double the fun!